Guest blog post by Tim Grey Buffalo Collardey. The views expressed here are his own. I witnessed the noted historian Howard Zinn’s last lecture given in 2009 shortly before he died. He very poignantly taught the lesson that there are differences in the ways Canada and the U.S. achieved independence from the UK that totally explain WHY they’re so different today. The U.S. chose violent revolution whereas Canada opted for a patient, more passive route. Zinn’s point also illuminates an important concept of the effects of corporate/institutional piracy. It has to do with a major case of plagiarism against the Iroquois by the notorious Founding Fathers of the United States of America. 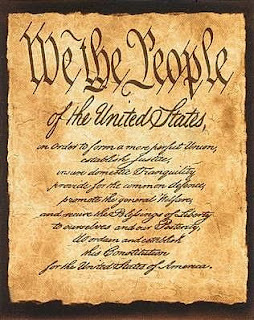 The U.S. Constitution is the longest-lived document of its kind in world history. It’s been amended but never fundamentally changed. It has served as a model for many countries and institutions for centuries. As school kids we’re taught that Roman law, the Bible, English common law, etc., influenced the framers’ efforts to hammer out the basis for “the greatest democracy in the world.” But a huge deletion in the annals of history regarding the subject is that the likes of Benjamin Franklin, Thomas Jefferson, et. al., based the new system on a model practiced a few hundred years BEFORE Columbus’ arrival that was hammered out by the indigenous tribes comprising the Iroquois Confederacy. The question has been analyzed and “twistasized” in more ways than one can imagine. The bottom line is Ben Franklin and his ilk formed a society significant enough to distinguish themselves from the British Empire at the expense of ancient peoples who had originally fostered a viable, peaceful society, based on peace not violence. It is called “The Great Law of Peace” But after all, they were only “heathens,” right? They weren’t even “smart enough” to realize how completely they were being ripped off. And to this day, by and large, they continue to be dis-engendered from their offspring that spawned the revolution of democracy that continues to rage across the surface of this Mother Earth. Observe Egypt today. Like any essay publishing MBA customer, it is usually distressing along statement of purpose for mba with concern if you attain the idea connected with publishing those true documents with the schools of one's option.